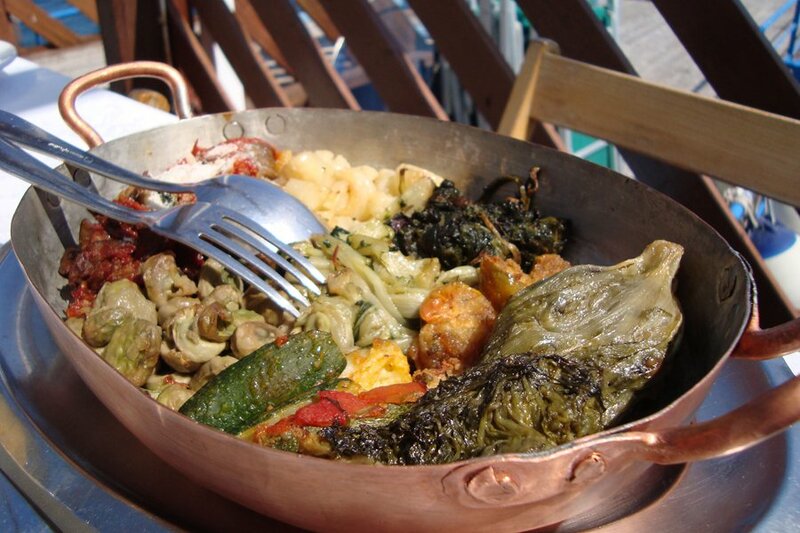 This is how a meal begins, with a big platter of vegetables. All photos by Pavia Rosati. In a country rich with restaurants and meals worth singing about, there's one in particular that's an extra special slice of food heaven. Popupla founder Pavia Rosati has a favorite place to go, to eat, to relax — and especially to eat. This is it. Sea views included. 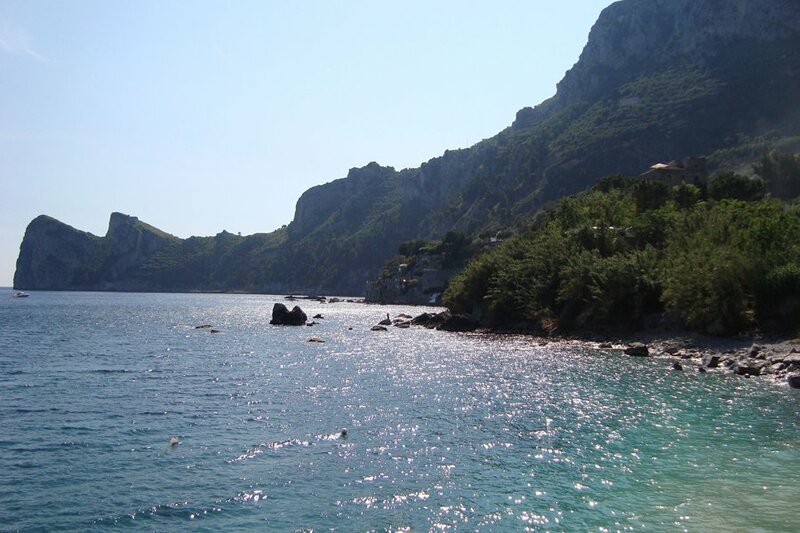 MARINA DEL CANTONE, Amalfi Coast – Thanksgiving may be the ultimate feast day in the United States, but the meal I'm always most grateful for is any one I have at on the Amalfi Coast. Maybe you've heard me talk about this place before. Maybe you've been there because I told you about it. Maybe you've even been there with me. I can't shut up about this place. I was introduced to Lo Scoglio on a rainy November day in 2003 by Ernesto Iaccarino, the chef at , the grand and glorious Italian restaurant and boutique hotel uphill in Sant' Agata sui due Golfi (another favorite, but that's for another story). I had been staying at Don Alfonso for a few days when my old-fashioned Italian-American father said to me, "If you don't get me a simple bowl of spaghetti soon, we're going to have problems." Ernesto, whose Michelin cuisine is anything but simple, said, "Let's go to my favorite restaurant." 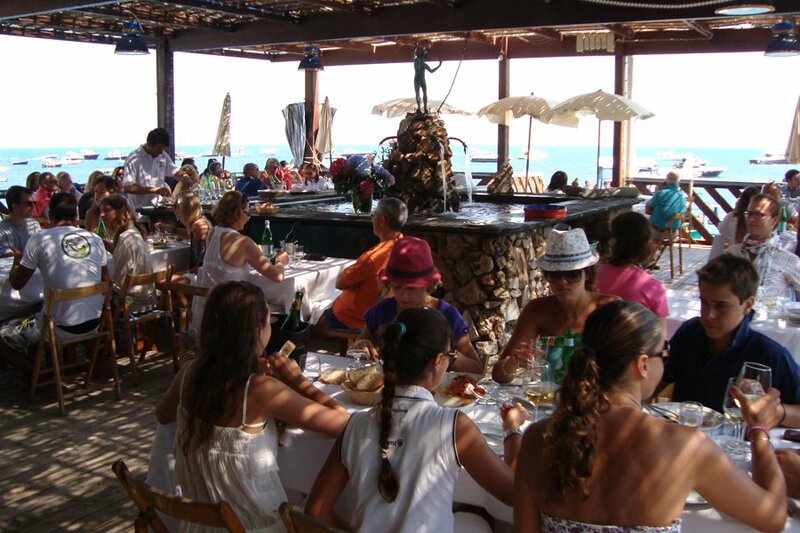 At the time, Lo Scoglio was a restaurant with a dining room deck built atop a boulder that jutted out into the sea. ("Scoglio" means "boulder.") Giuseppe De Simone, the owner, hadn't yet begun the renovation that would convert it from just a restaurant into a restaurant with a dozen hotel rooms upstairs. The place was empty, and we took a table at the edge of the dining room. Waves were crashing up against the sliding doors beside us. We were about 30 feet above sea level: This was a really rainy day. Guiseppe (whom everyone calls "Peppino" except me; I call him "Beppe") and Ernesto are dear friends, so he sat down with us and told us stories about his family, his restaurant, the sea, and his food — all sources of deep pride. Beppe is a character, a fiesty Neapolitan straight out of central casting. He loves to fish and he loves tending the land. I call him the pirate farmer. One bite into our heaping bowls of spaghetti with zucchini, the house special, my father let out a low moan of joy. He moaned for my mother and me, too. We were too busy eating. Love affairs have been built on less, and mine with Lo Scoglio and the De Simone family has been going strong ever since. I come back at least once a year — by myself, with my dad, with my husband, with Italian relatives, with big and small groups of friends. Everybody loves Lo Scoglio. Dinner and breakfast are terrific, but lunch is really the thing here. That's when you have the best sunshine and the best views onto the Tyrrhenian Sea. 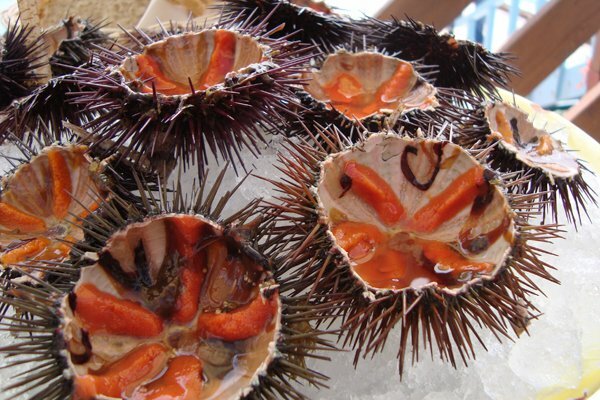 Appetizers continue: sea urchins on ice. The best way to start the meal, or to continue the appetizers, depending the order of your courses, is with several platters of fresh seafood. There's a great old guy, a real salt-of-the-sea figure, who walks around Lo Scoglio in a Speedo carrying a spear and a netted bag. He's got to be in his 70s. He's the urchin man, and it's not uncommon to find him hoisting himself up onto the deck around noon (with a lot more grace than "hoist" would imply) with the morning's haul collected from the surounding waters, ready to serve throughout the day. A sampling of the morning's pick from the family farm: fava beans and zucchini blossoms. The family has a farm — in fact, several farms and plots of land, all dotted around the Sorrentine Peninsula. 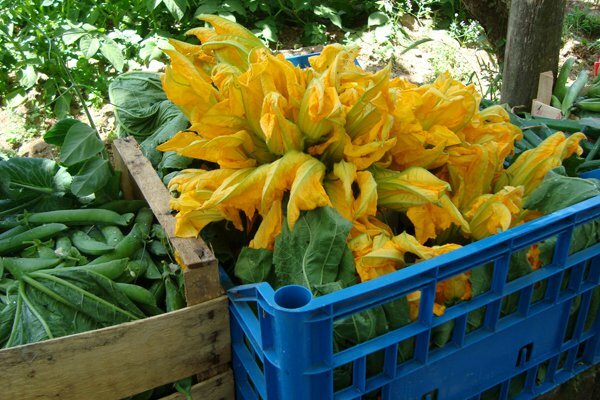 Beppe is an obsessive farmer, constantly experimenting and tinkering to see which elevation is the best for that particular breed of favas, green beans, zucchini. While you're sleeping or debating whether to have a third cappuccino for breakfast, he's collecting the tomatoes you'll be having for lunch. My English husband likes to tell a story about Lo Scoglio. "You will fly to Naples, perhaps from London directly, perhaps from New York with a transfer in Munich, Milan, or Rome. You will then take the scenic or eternal Circumvesuviana train around the bay of Naples, or, more likely, Lo Scoglio will have sent , everyone's favorite local driver. The road is long and twisty, slow and annoying. You will be dizzy. You will be so nauseous that the views won't soothe you. You will tumble into Lo Scoglio, in other word, in a state. And then you will sit down on the deck, order a bottle of white wine and a tomato salad. And when you have the first bite, the hideous journey will immediately disappear and you'll actually say out loud, 'okay. NOW I get it.'" 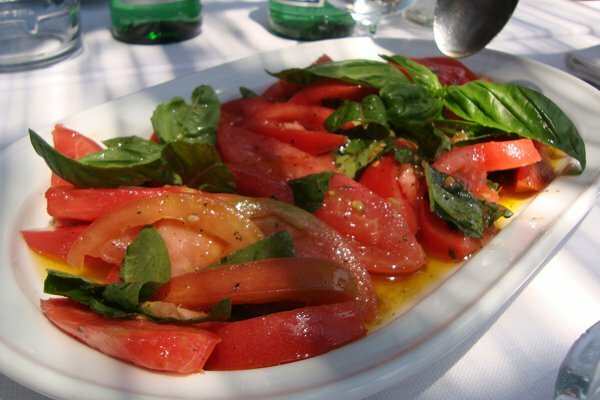 This is the tomato salad. It's that magical. 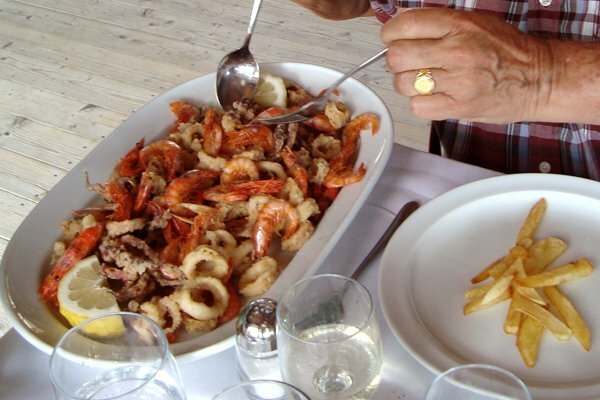 More seafood starters: a nice plate of fritto misto, with calamari, shrimp, and a side of French fries. (We always forget the fries until the last day. Don't make that mistake.) Those are my father's hands. He didn't care that I was busy staging a photo shoot; he couldn't wait to dive in. On to pasta. 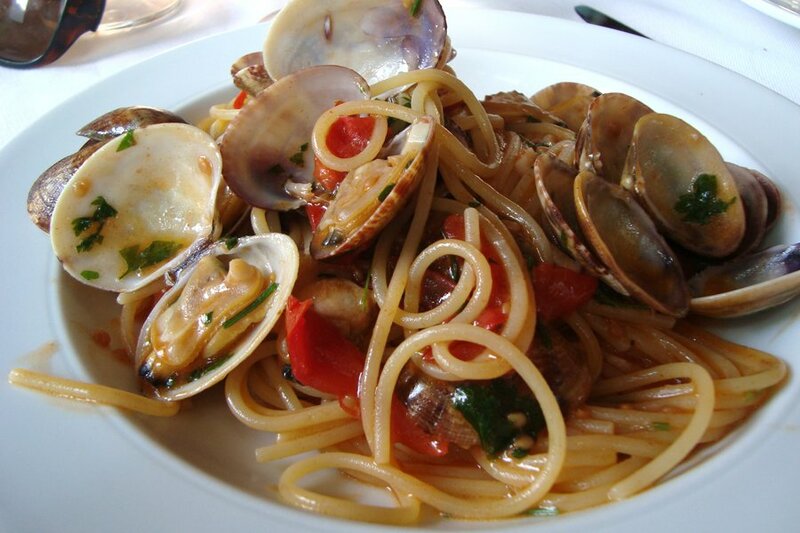 Linguini alle vongole (with clams) is my favorite pasta. I like it macchiato — "stained" with fresh tomatoes. 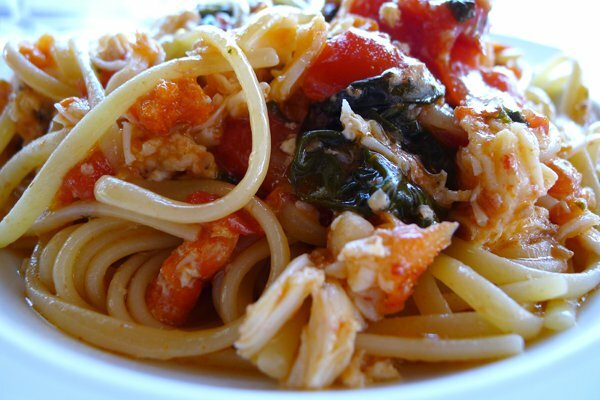 Or maybe you'd prefer linguini all'aragotsa, with lobster sauce. Antonino, one of the beloved chefs, making spaghetti alle vongole macchiato. I spend a lot of time in the kitchen when I'm here. I help Santina (the hot and hard-working mom) shell peas, I slice cherry tomatoes into sixths. (Sixths.) I try not to be too much of a nuisance, and they're very patient with me. The regular chefs are Antonino, Gaetano, Tommaso (Beppe's son, the youngest of three), and Antonietta (Beppe's mother and the matriarch of the family). As far as she's concerned, no one does anything right — or as right as she does. I have a particular affinity for Antonino. 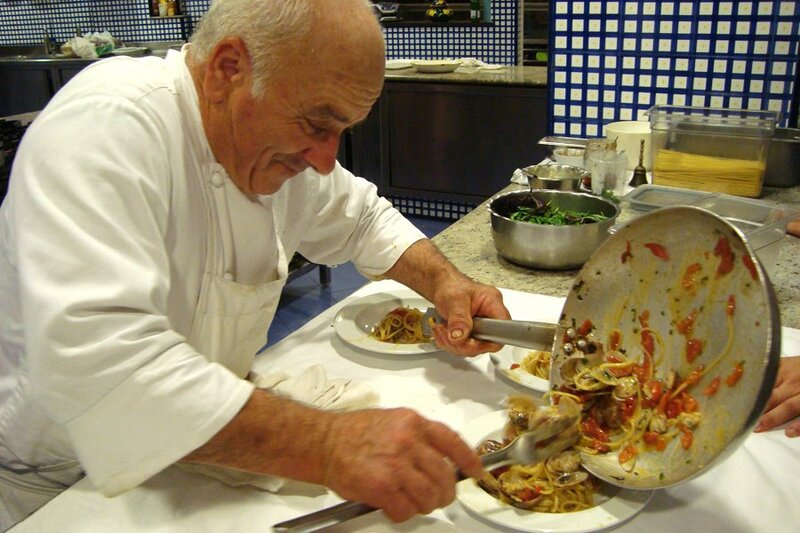 My own Italian grandfather, Nello, was a chef who died when I was 11. And although Nello was at least a foot taller and from Spoleto and not Naples, Antonino is an excellent grandfatherly substitute. He's taught me never to add red pepper flakes while cooking until the end, among other tricks. Not that my food is anywhere near as tasty as his. 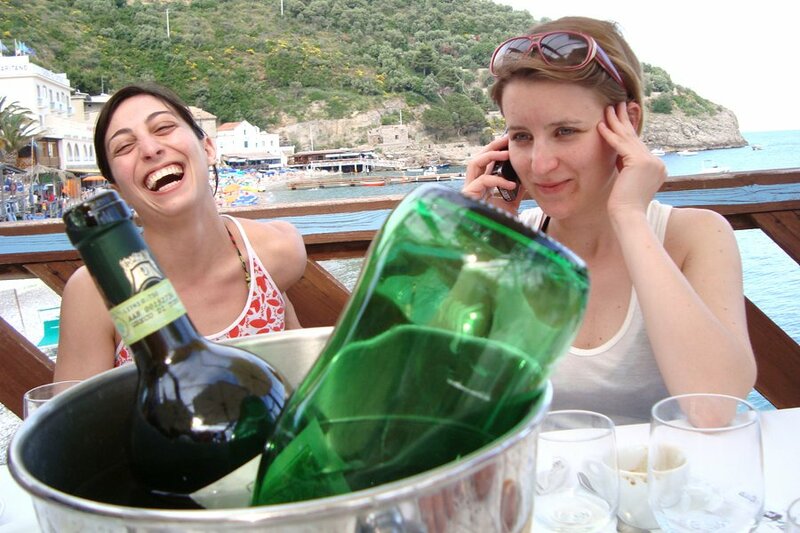 A few years ago, Popupla editorial director Jeralyn Gerba and our dear friend Danielle Bufalini came with me, my husband, and my father to Lo Scoglio. (Assembling a motley crew is half the fun.) One afternoon we dragooned the chefs into giving us cooking lessons. We spent hours in the kitchen making all kinds of things. 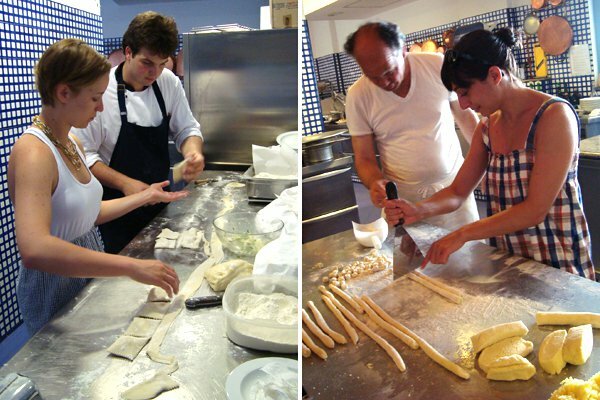 On the left, Jeralyn is learning to make ravioli with Tommaso; on the right, Danielle is making gnocchi with Gaetano. Everyone is always happy here. Always. Danielle and Jeralyn recovering from a hard day in the kitchen. Lunches here are a many-hour affair. You never want to get up from the table. When in doubt, have the fish. 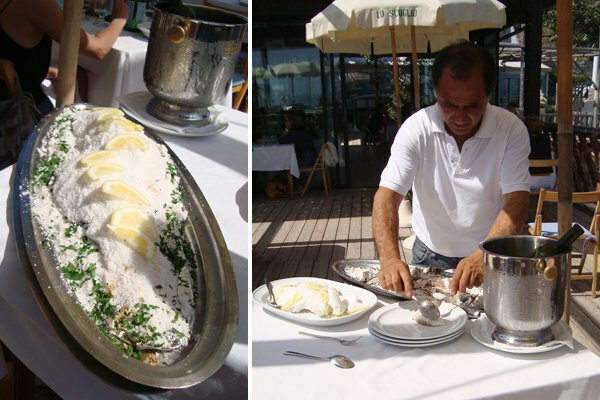 A whole fish, probably a branzino, roasted in salt and prepared tableside. It's not all fish. 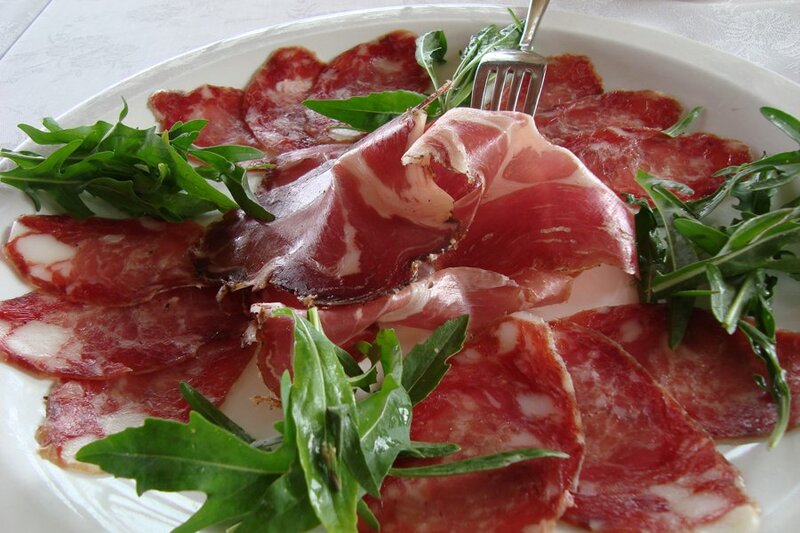 I like a nice salumi plate after vegetables. These are the happy pigs that make the salumi. They live on the farm and only eat vegetables from the farm. You've never had cured meat like this. You can't forget the wine. 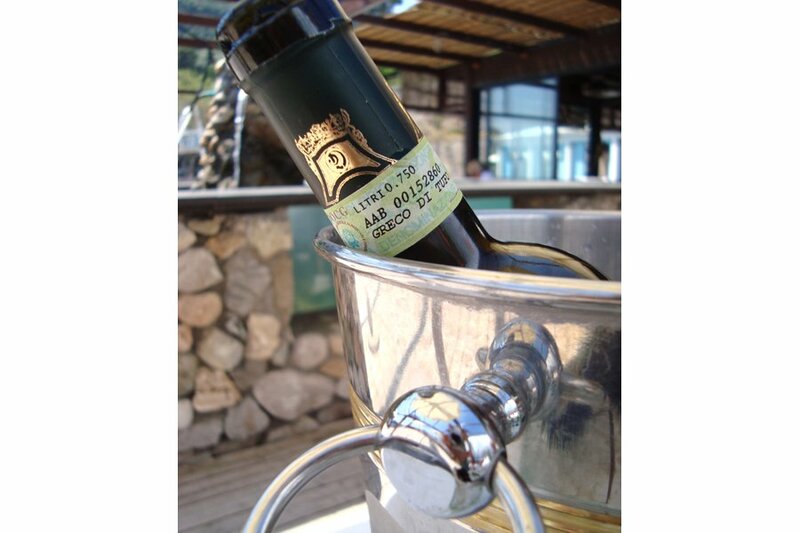 When in Campania, drink a nice crisp local white: fiano d' Avellino, greco di tufo, falanghina. Go ahead and drink it by the case. Dessert. 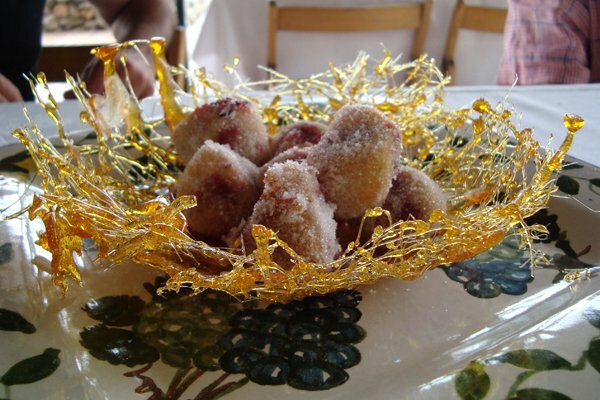 Some crazy spun sugar and fried dough concoction. Tommaso loves pastry, as does his older sister, Margherita, and her boyfriend, Robert. The three of them go into the kitchen, and magic emerges. 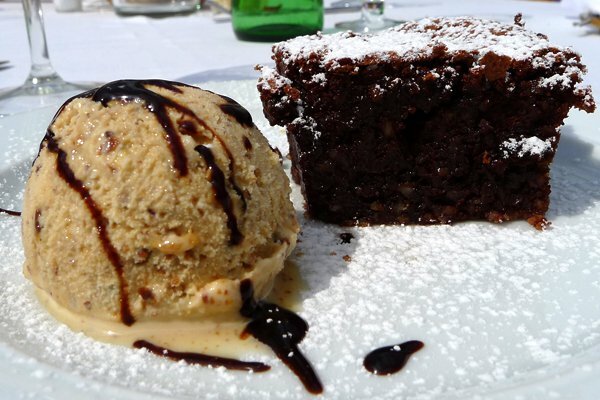 For example, homemade hazelnut ice cream served with Caprese, a local chocolate cake. 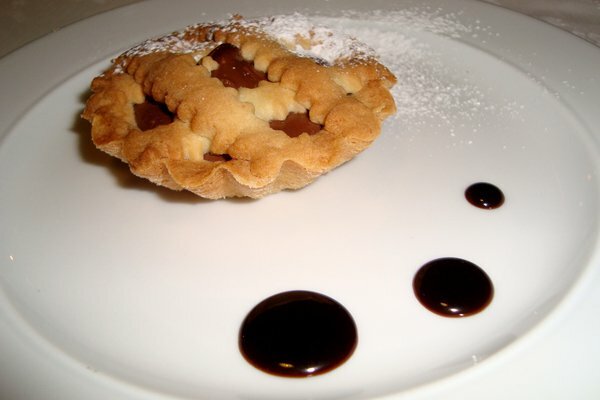 And chocolate tarte with dark chocolate sauce. A healthier dessert option. Or maybe a final dessert. 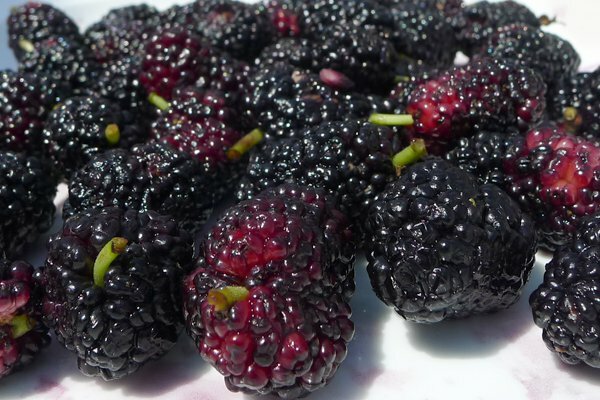 More are a sweet and barely tart berry that stain everything they touch a deep purple. They can also be pale white, like albino fruit. I once fed them to Nora Ephron when I was giving her a tour of the kitchen. I hadn't realized who she was when Beppe asked me, "Can you show these nice American ladies around...in English?" 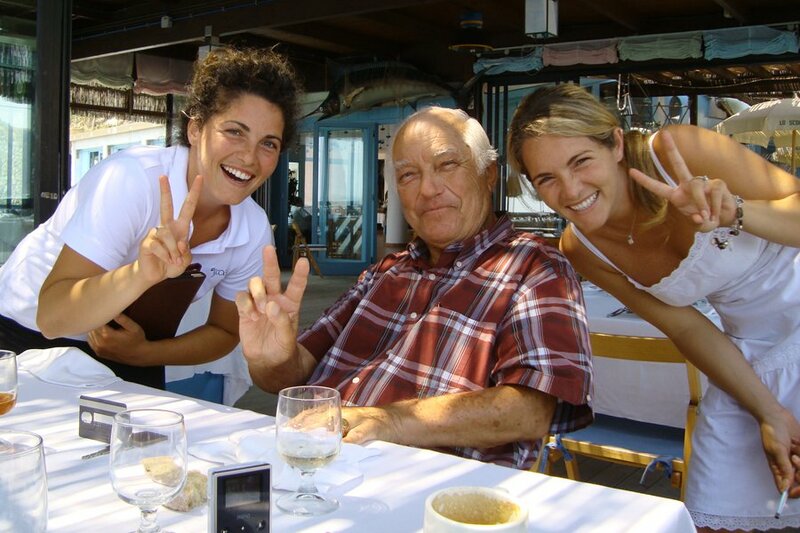 Nora used to visit every year, usually with Larry Ellison and his yacht, but no one at Lo Scoglio ever knew who she was. The fruit of the vine. 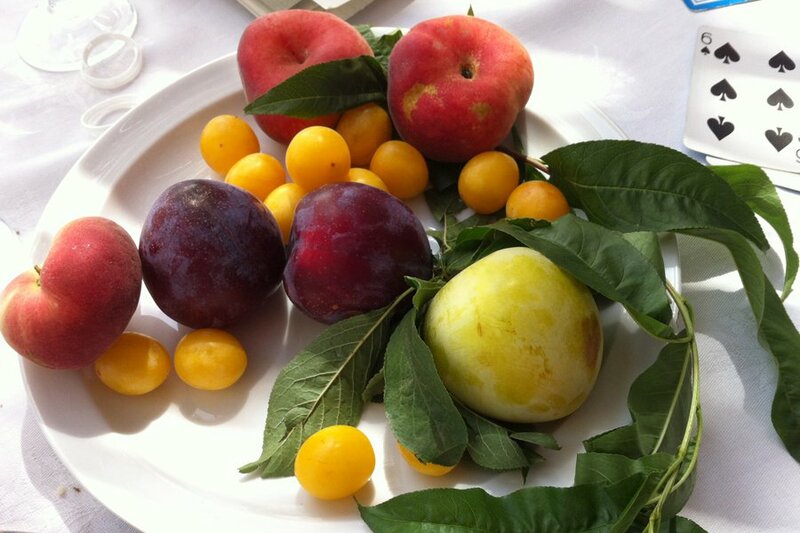 You could live on the fruit at Lo Scoglio. And you almost can, if you consider that they also use the fruit to make jams for breakfast. 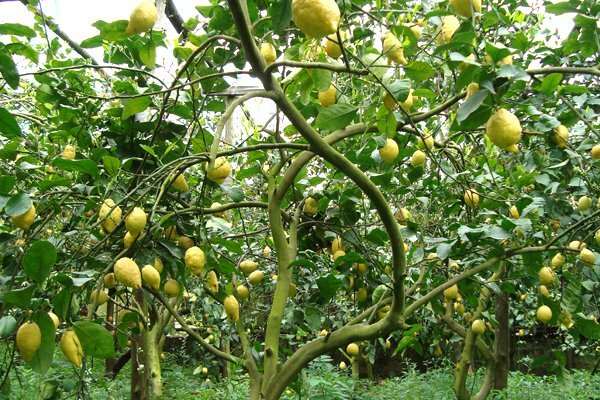 Lemons are a special crop in Campania, and not only for the limoncello they go into. Beppe has two lemon arbors on his main farm. The trees are protected and cared for like coddled and cherished children. He planed a walnut tree nearby a few years ago. "It won't be any good in my lifetime," he said, "but my grandchildren will love these walnuts one day." He told me this before he had grandchildren, before any of his three children even had a serious partner. Jeralyn and Beppe at the farm. Beppe has a special tree that yields sweet lemons. He made me swear never to tell anyone about it, but I don't think he meant it. Here, Jeralyn and Beppe are eating one. It really is sweet. The summer scene in the dining room. 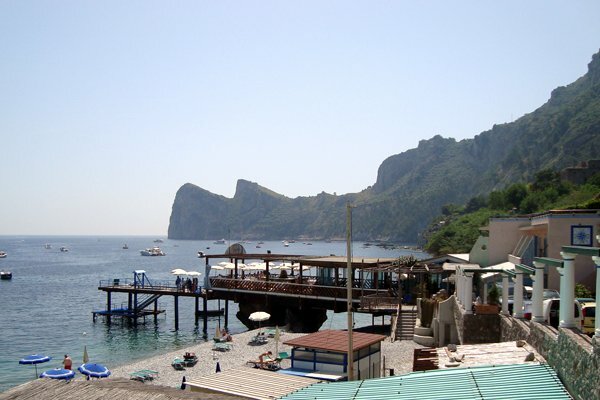 Lo Scoglio is an unlikely celebrity haunt, but it attracts a crowd, especially in the summertime when the yacht-going crowd from Capri dock their boats in the marina and come ashore for three-hour lunches. (Though technically since the dining room is on a deck, no one ever actually touches a shore.) In addition to Nora Ephron and Larry Ellison, over the years I've seen Michael Kors and Steven Spielberg, as well as Lapo Elkann, who has been coming since his grandfather, Gianni Agnelli, was a regular. Not to mention lots of Italian senators and singers and actors and race car drivers whose names I don't know. If I kept track of Italian tabloids, this list would be a lot longer. Margherita, Giacomo, and Antonia in the summertime. 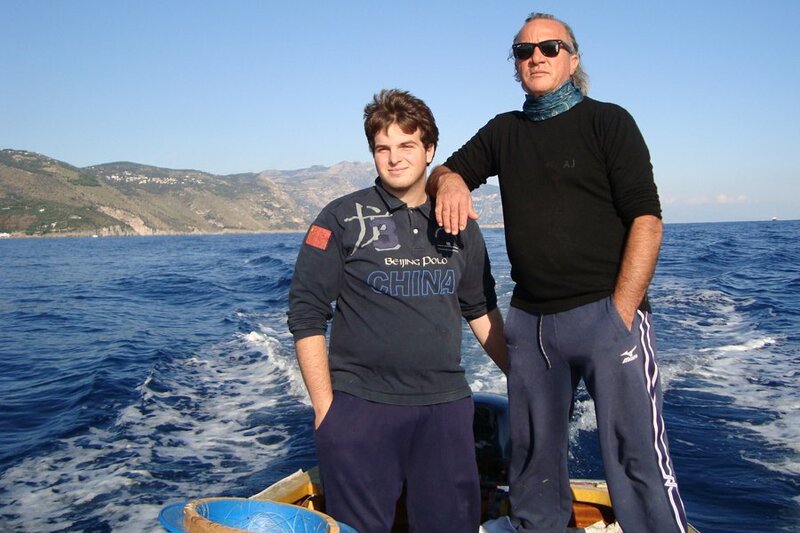 Tommaso and Beppe on a fishing expedition. One October day after a crazy storm, I went fishing with Beppe and Tommaso at sunset. Fishing bores me to tears, but I hauled the lines and helped out. The scenery was very distracting. Beppe insists he can taste the difference between fish caught in the various coves around Lo Scoglio. Which is to say fish that live maybe 100 feet apart, or whatever the measure for fish real estate is. He could be telling fisherman's tales, but I believe him. Santina, the mom, and Antonietta, the grandmom. Santina and Antonietta are passionate Neapolitans and they excel at extremes. They're hard-working and fun, tough and loving. These are women you want to keep on your good side, which is where they'd rather be anyway. The rocky beach in the summertime, seen from the dining room deck at Lo Scoglio. Let me give you a sense of place: Lo Scoglio is located on the Sorrentine Peninsula, one cove over from the point where the Bay of Naples to the north meets the Bay of Salerno to the south. The main road — and the hordes who are on it — beats a path from Sorrento to Positano, totally cutting off the peninsula. 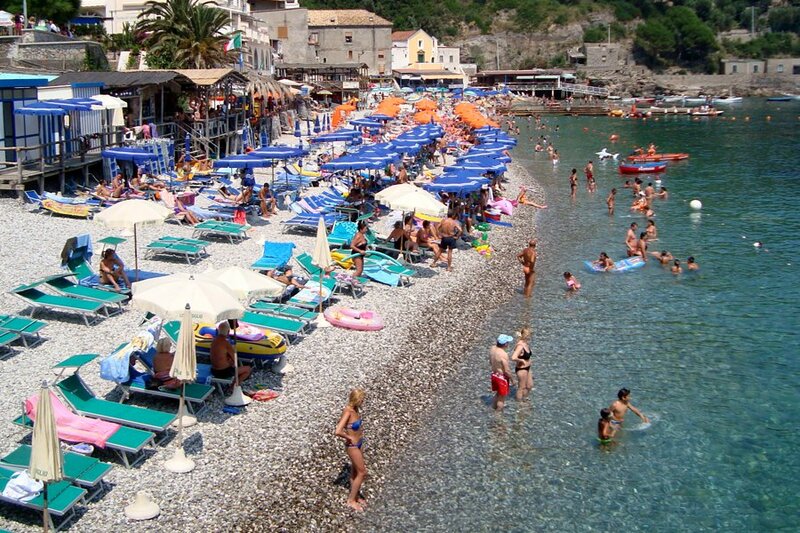 This means that the only people on this stretch of Amalfi Coast are Italians and travelers who know better. Capri, that other tourist magnet, is just around the bend, slightly out to sea, easily accessible on a day trip from the dock. This is the view to the north. 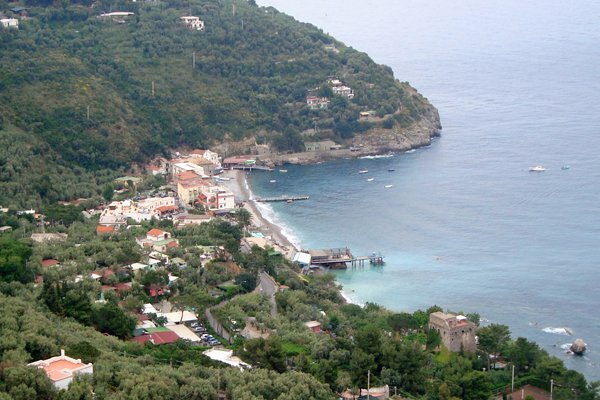 Marina del Cantone is a former sleepy fishing village that is now a seaside destination with a number of hotels, restaurants, and campgrounds. Not that I've ever visited any of them or eaten anywhere else. Once I hit Lo Scoglio's driveway, I never leave the compound. Marina del Cantone, seen from Nerano, the town two kilometers uphill. (There's only one road.) Lo Scoglio is the building jutting out onto the water. 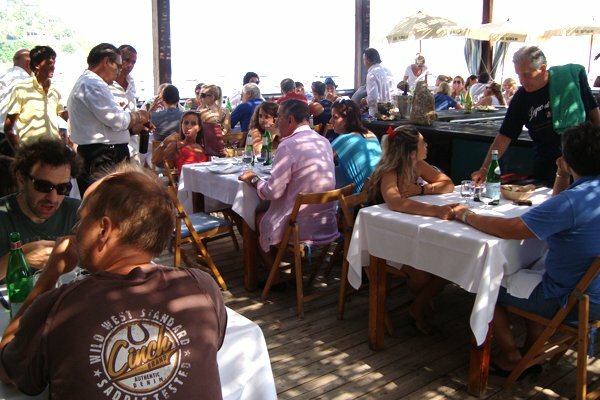 It's the only restaurant literally on the water on the Amalfi Coast. Lo Scoglio, seen from the small piazza. If you do leave Lo Scoglio, walk into the piazza to have a pair of sandals custom-fit at the tiny shop Il Piccolo Positano. (You can't miss it: There's only one shop.) Come before lunch, and they'll be ready by the end. The prices are better than they are in Positano, too. 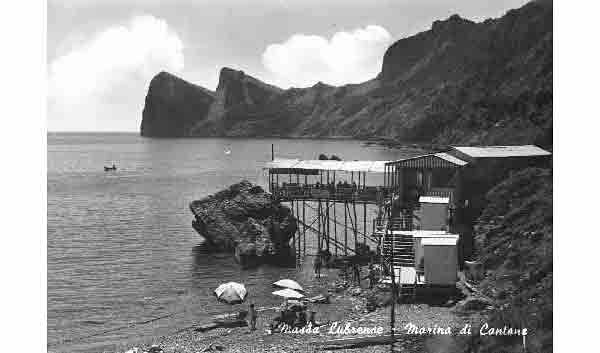 An old postcard of Lo Scoglio. Photo courtesy Margherita De Simone. It's changed over the years, but some things will never change. It will always be the best meal you've ever had. Fly: The easiest route is to arrive at Naples Airport (CAP) and have Lo Scoglio send a car for you for the 60- to 90-minute journey, depending on the vagaries of Amalfi Coast traffic, which is always reliably bonkers. Car: If you don't want to rent a car at the Naples Airport or in Sorrento, let Fabrizio Fiorinelli from do the driving for you. He's kind and knowledgeable and he speaks English. Contact him at [email protected] or +39-338-324-3809 and tell him Popupla sent you. 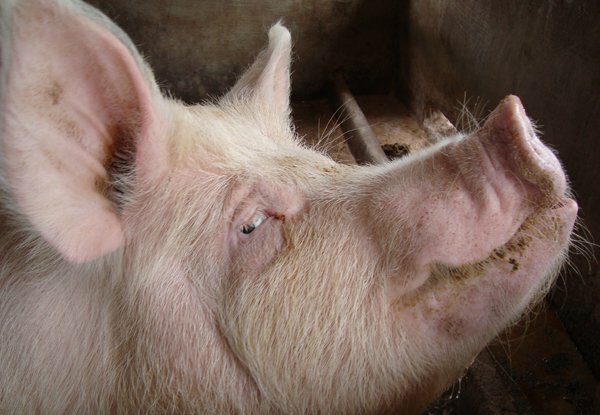 Наша организация предлагает купить ковровые дорожки по вашему желанию, недорого. У нашей компании классный портал , он описывает в статьях про progressive.ua.